Dear Mr. President: As promised in the letter that I sent to you on Wednesday, September 7,2011, I am writing to provide additional information in support of Governor Perry's request that you grant a Major Disaster Declaration for the state of Texas due to the catastrophic wildfire season that we are facing this year. In the event and to the extent that it may be necessary to do so, I hereby reiterate that request and incorporate each of our prior letters by reference as if set forth fully herein, including Governor Perry's initial request letter dated April 16, 2011, and my letter dated September 7, 2011. Following an appeal from the denial of Governor Perry's initial request, you approved a limited Major Disaster Declaration (DR-l999-TX) on July I ,2017, covering wildland fires that occurred in a limited number of Texas counties during an incident period of April 6, 201I, through May 3, 2011. Due to the continued high risk conditions that resulted in numerous fires throughout ih. Stut", Governor Perry requested, as recently as August 12,2011, that you expand and extend that declaration to cover the entire risk period beginning on March 1,2011, and continuing until disaster conditions have ended. The number and impact of the fires that have occurred this year are astounding. 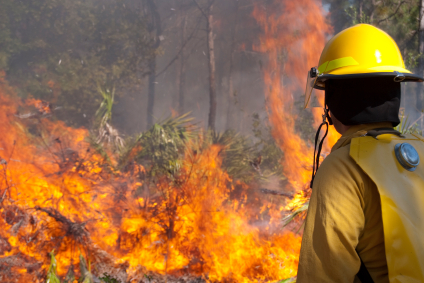 Between December 21 and September 4,2011, Texas experienced and responded to at least 19,330 fires, statewide. These fires burned more than 3,547 ,972 acres and destroyed 1,077 homes and 2,377 other structures. Diligent firefighting efforts resulted in the saving of over 28,300 threatened homes. At least 250 of our 254 counties have burn bans in place. As you now know, the severity of this ongoing disaster intensified tremendously on Sunday, September 4, 2011, when the severe risk that existed due to extended drought conditions was exacerbated by elevated fire weather conditions. Combined with low relative humidity, numerous wildfires began to spread rapidly in several areas around the State. Since that day, the Texas Forest Service (TFS) has responded to at least 140 fires for 154,300 acres and at least 1,600 homes and 185 other structures have been destroyed. Significant fires have occurred and remain in the counties of Bastrop, Bexar, Cass, Colorado, Fayette, Gregg, Grimes, Houston, Leon, Marion, Montgomery, Nacogdoches, Navarto, Palo Pinto, Smith, Travis, Walker, Waller, and Williamson. These numbers do not include fires that local fire departments have responded to on their own without State assistance. Sadly, we have discovered multiple fatalities, and have had to prepare ourselves for the likelihood that we will discover more. All available resources have been mustered to address these emergencies. Additional National Guard Blackhawk helicopters, strike teams from the Texas Intrastate Fire Mutual Aid System, and a heavy air tanker from South Dakota were mobilized on Sunday. TFS has deployed dozens of aircraft, including 6 heavy aietankers, 15 single-engine airtankers, 12 helicopters, and l3 aerial supervision aircraft. A 12,000-gallon DC-10 airtanker is expected to be activated today. Three Type I Incident Management Teams have been deployed. Data from NOAA's National Climatic Data Center (NCDC) indicate that the 1O-month period from October 2010 through July 2011 was the driest and the sixth warmest period on record in Texas. July was the hottest month ever on record, with an average temperature of 87 .2 degrees. Several counties have experienced multiple consecutive days of over 100 degree temperatures. All available statistics indicate that we are in the most sever one-year drought in the State's history. The National Drought Monitor indicates that drought covers 100 percent of the State, with 94.42 percent of Texas under D3 (extreme) and D4 (exceptional) levels of drought. Unfortunately, current weather projections indicate that neither this drought nor the imminent threat of wildfires will subside anytime soon. Although monsoonal and tropical moisture typically increase in September over far west Texas and the Gulf Coast, a dome of high pressure that has stalled over the State is expected to result in these dry conditions for at least the next month, sustaining the severe risk of large and destructive fires and the serious threat to the safety of our citizens and their property. In response to this situation, on December 2T,2010, Governor Perry directed the execution of the State Emergency Management Plan in accordance with Section 401 of the Stafford Act. His initial gubernatorial declaration of a state of disaster included 252 counties. He has renewed that proclamation each month since then, and expanded it to include all 254 counties as threatened by exceptional drought conditions and extreme wildfire danger. The State of Texas has developed a Strategic Natural Hazard Mitigation Plan, which FEMA approved on October 27, 2010. This current disaster provides an opportunity to implement Hazard Mitigation projects that will reduce the impact of future disasters of this nature in the years to come. HICKORY HILL CEMETARY, Camp County. 181 acres, contained. Burning in cutover and pine. DAM, Hill County. 250 acres, 80 percent contained. It appears that up to six homes were lost on this fire yesterday. BASTROP COUNTY COMPLEX, Bastrop County. 34,068 acres, 30 percent contained. Crews and equipment continue to mop up and patrol. Good progress was made on the fire yesterday. An assessment team has confirmed 1,386 homes have been destroyed. Two civilians were found dead Tuesday as search crews went through the charred subdivisions. A Southem Area Type I Incident Management Team is assisting in managing the fire. BEAR CREEK (#536), Cass County. 25,000 acres, unknown containment. Acreage rnay be higher than what is estimated at this time. MODIS satellite image indicates approximately 40,000 acres have bumed. The fire is burning very actively in heavy timber and is threatening nurnerous houses. Scoopers, heavy airtankers, and TIFMAS engines are assisting. Eight homes have been destroyed. A Type 1 Incident Management Team is assisting with management of the fire. PEDERNALES BEND (Spicewood), Travis County. 6,500 acres, 80 percent contained. The fire is burning four miles southeast of Spicewood. 32 homes were destroyed. RILEY ROAD, Grimes/Montgomery/Waller counties. 15,000+ acres, 60 percent contained. Active fire behavior was observed yesterday as the fire moved to the southwest in Waller County. Approximately seventy-five homes have been destroyed on this fire burning just west of Magnolia. UNION CHAPEL, Bastrop County. 719 aues,90 percent contained. Twenty-five homes were destroyed on this fire just west of Bastrop. Aircraft responded immediately after the fire was reported, but were ineffective in the windy conditions. WHITE OAK ROAD, Gregg County. 300 acres, 80 percent contained. The fire is buming in pine and hardwood. PETERS CHAPEL, Harrison County. 650 acres, 80 percent contained. The fire is buming actively in pine plantation. Numerous homes have been evacuated. Two homes were destroyed. CLARKSVILLE, Red River County. 350 acres, 90 percent contained. Two homes were lost on this timber and grass fire burning near Clarksville. #521, Cherokee/Rusk County. 256 acres, 90 percent contained. #538 (Lansing Switch Road), Harrison County. 200 acres, 50 percent contained. The fire is buming in pine and hardwoods. DELHI, Caldwell County. 6,000 acres, 85 percent contained. Twenty homes were saved and six were lost on this fire east of Lockhart. BAILEY, Colorado County. 2,300 acres, 90% contained. This fast-moving fire threatened 40 homes near Columbus. 14 homes were destroyed. DIANA (#545), Upshur County. 2,500 acres,70 percent contained. The fire is buming in grass and timber. Twenty homes are threatened. LUTHERHILL Fayette County. 2,700 acres, 95 percent contained. The community of Ruttersville was evacuated. Foufteen homes were destroyed. BONBIEW RANCH, Yan Zandt County. 350 acres, 80 percent contained. Twenty homes were saved southeast of Canton. MOORE, Smith County. 1,556 acres, 90 percent contained. Ten homes were evacuated and five were lost on this fire burning on the Smith/Gregg County line. The fire continued to be active Wednesday night. Two civilian fatalities were reported last Sunday. BOOT WALKER (#553), Marion County. 1,000 acres, unknown containment. A wind shift to the south could threaten 30 homes. STEINER RANCH, Travis County. 125 acres, 50o/o contained. The fires started just north of the Steiner Ranch Sub-division. More than 1,000 homes evacuated. 23 homes were destroyed. TOAD ROAD (#552), Upshur County. 350 acres, unknown containment. The fire is burning in timber. Three homes were lost and dozens remain threatened. HALSBRO COMPLEX, Red River County. 958 acres, 95 percent contained. The fire is buming in grass. Fifteen homes are threatened. #507- Anderson County. 1,400 acres, unknown containment. #504, Anderson County. 800 acres, unknown containment. #5020 Nacogdoches County. 4,000 acres, unknown containment. MODIS satellite shows the fire may be approximately 9,000 acres. The fire was very active yesterday. More than a dozen homes have been evacuated. ARBOR, Houston County. 3,000 acres, 90 percent contained. The fire is burning in timber. Up to 15 homes are reported lost. OLD MAGNOLIA' Gregg County. 1,000 acres, 80 percent contained. Several structures and a gas plant are threatened. #839, Leon County (Concord Robbins). 4,689 acres, 90o/o contained. 22 homes were destroyed and more than 300 were evacuated. 101 RANCH, Palo Pinto County. 6,555 acres, 85 percent contained. The fire is burning on the south side of Possum Kingdom Lake near the town of Brad. Thirty-nine homes and nine RV's have been reported destroyed. Crews continue to mop up and aircraft are monitoring. Because most of these fires are still burning, it has not been possible to even begin, much less complete, preliminary damage assessments in most of these areas. Accordingly, it is not possible to provide detailed damage information for most of these areas at this time. On September 5, 2011, Governor Perry requested a joint federal, state, and local survey of the damaged areas in Bastrop County, where the fire is over 34,000 acres. In that county alone, Preliminary Damage Assessments have indicated that at least 1,386 homes and 20 businesses have been destroyed. Many homes that were saved have sustained extensive smoke and water damage. More than 800 first responders have answered the call to fight the Bastrop County Complex Fire, and more than 5 shelters have been opened to house the more than 5,000 evacuated individuals. A lack of potable water, electricity, and phone services has affected the entire county. Clearly, the threshold of losses necessary to qualify for Individual Assistance has been exceeded in Bastrop County, and I accordingly request that you add that assistance to the terms of your disaster declaration. Similar requests for additional counties will be submitted as those fires are controlled and damage assessments are completed. Texas Department of Public Safety (DPS): DPS has dedicated hundreds of state troopers to support traffic coordination, perimeter control, and evacuation assistance to ensure public safety from the effects of wildfires across the state of Texas. DPS has been engaged in this effort since November of 2010. Beginning on September 4,2010 DPS has assigned a significant number of state troopers to support the wildfire operations for the Labor Day Fire event, specifically dedicating over 30 personnel to the Bastrop Complex Fire, on a daily basis. While this number may seem insignificant, there are concurrent fires that are occurring across the state and over a very large geographic region. State Troopers have to stay in their areas in order to support any additional fìrefighting efforts. Because wildfire danger is at an all time record, the allocation of Troopers from one district to another reduces the public safety in another and consequently, this re-allocation cannot occur. Additionally, DPS aviation has committed hundreds of hours in flight time to assist in fighting wildfires and conducting aerial surveys. For the Labor Day Fire period DPS has committed a minimum 5 aircraft daily to this event. Dedication of these aircraft to these firefighting efforts creates a significant impact to the agency's statewide law enforcement mission. Texas Commission on Environmental Quality (TCEQ): TCEQ has deployed emergency response liaisons to the Incident Command Centers in Bastrop and to the Incident Command at Steiner Ranch in Travis County. 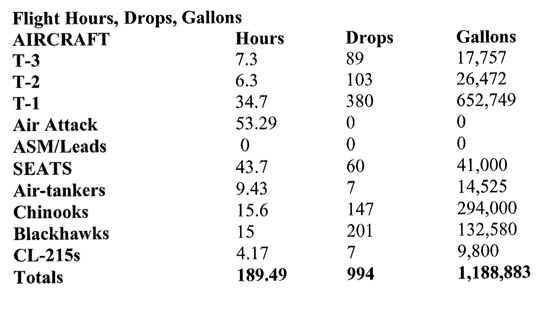 There are 14 public water systems in Bastrop County. Currently, two systems have reported receiving fire damage' and seven water systems are on unknown status due to shortage in availability of water system operators. Only five water systems have reported to be fully operational; two systems have issued boil water notices, Bastrop County WCID #2 and Aqua WSC' Out of 18 wastewater treatment plants in Bastrop County, sixteen are operational, one unknown and one has been evacuated. Additionally, TCEQ has been monitoring air quality statewide and issuing health statements relative to ensuring individuals know how to protect themselves and their families. Texas Department of State Health Services (DSHS): DSHS have been involved in supporting wildfire operations dedicating public health survey teams to ensure public safety is maintained in the hundreds of shelters that have been opened across the state during the entire wildfire event. Additionally, DSHS has responded and provided support to firefighters, providing direct medical support and rehab for firefighters affected by such things as heat exhaustion and or smoke inhalation. Disaster Behavioral support is being provided to those impacted by the fires. Texas Department of Transportation (TXDOT): TxDOT performed traffic control and provided fuel to volunteer firefighters. TxDOT is providing personnel, equipment, and other assets, to assist as needed in fighting the wildfires. TxDOT Dynamic Message Signs will be activated to read "Extreme Fire Danger". Texas Military Forces (TMF): TMF has three Ground Wild Fire Support Force Packages: TF60 operating in the vicinity of (IVO) Tyler; TF61 operating IVO Bastrop County Complex Fire, Bastrop Co.; and TF63 IVO Bailey Fire, Colorado Co. TMF also has three Aviation Wild Fire Support Force Packages: 3 each UH-60s in support of (ISO) Bastrop County Complex Fire,2 each CH-47 helicopters ISO Bastrop County Complex Fire;2 each UH-60s ISO Bailey Fire, Colorado Co. and I each UH-60 staged in Austin. UH-60s REDCON 2 and the 2 CH47s will be at REDCON 1 (Sat-Mon). This aviation support has been in place and supporting operations since March of 2011. Texas Department of Agriculture (TDA): The Texas Department of Agriculture activated its State of Texas Agricultural Relief Fund (STAR Fund). The fund was created to collect monetary contributions from private individuals and entities to assist farmers and ranchers in responding to and recovering from an emergency. The second round of applications for Operation New Fences is commencing. TDA is also encouraging impacted ranchers to utilize the Hay Hotline to locate forage and hay supplies. The listings include individuals and businesses in-state and out-of-state that have hay for sale or for donation, pasture for lease, and transportation options. TDA also continues to stay in contact with the Texas Animal Health Commission, Agrilife Extension, other state agencies, and industry stakeholders. Texas Parks and Wildlife: (TPWD): Bastrop State Park is 98% destroyed. The regional office building and residences on site were destroyed. All equipment in office; records, 14 new state park trucks, dump truck, 50 LE Tasers, 20 M4 rifles, 50 smith and Wesson side arms, were lost. Almost all cabins and shelters were damaged or destroyed as well as picnic shelters. Game Wardens, State Park firefìghters, and State Park Law Enforcement Rangers continue to fight the fire. Over 24 fire firefighters and 56 support personnel/equipment operators remain assigned to fighting fire. Additionally, game wardens are assisting local jurisdictions with Law Enforcement issues on the Colorado River preventing looting, trespassing, and entering of subdivisions via water. Texas Animal Health Commission (TAHC): TAHC Field personnel from the Texas Animal Health Commission (TAHC) continue to coordinate with officials in counties affected by wild fires across the state and stand ready to provide technical assistance, if needed. TAHC has been providing resources such as cattle panels and large animal shelters across the state and has established several locations in the Bastrop area to support large animal sheltering. Additionally, TAHC is working to identify adequate feed supplies and hay supplies of horse quality, as there is a large shortage across the state as a result of wildfires and drought. Voluntary Agencies: The Texas Baptist Men & Southern Baptist of Texas Convention deployed kitchens, in addition to the American Red Cross for sheltering and The Salvation Army is Committee. Victim Relief Ministries and United Methodist Committee on Relief are providing emotional and spiritual care at the shelters. The Adventist Community Services arrived Tuesday with clothing for displaced residents. In response to the Steiner Ranch Fire, the American Red Cross is providing sheltering for displaced residents and Austin Disaster Relief Network is providing emotional and spiritual care and will assist with the recovery and rebuilding efforts. On behalf of Governor Perry and the State of Texas, I certify that the State and local governments will assume all applicable non-federal shares of costs required by the Stafford Act for this disaster. With regard to the Other Needs Assistance Program as laid out in Enclosure D, the state's share of the total is expected to exceed $4,653.00 in order to cover the estimated 14 families that may require renter's assistance. Finally, please be advised that Chief Nim Kidd, Texas Division of Emergency Management, has been designated as the State Coordinating Officer for this request. He will work with FEMA on damage assessments, and may provide further information or justification on my behalf.